Here are two glass vases. 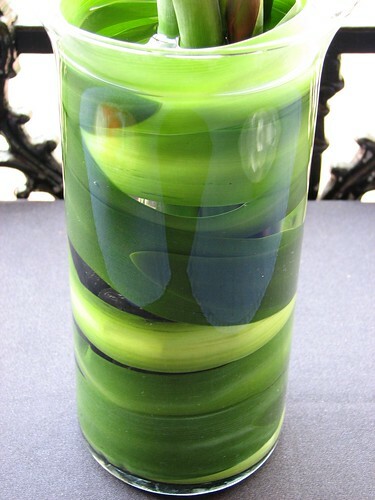 The first one looks like painted green glass, but it is actually a clear vase with leaves from a bird of paradise plant lining the inside. The second is from our favorite restaurant in Newport, RI, Tucker's Bistro. 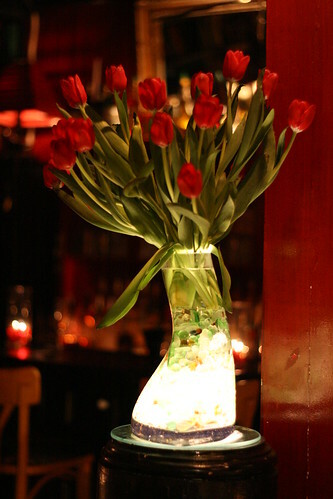 Every year when we visit, we are always greeted to a beautiful display of tulips in a lighted vase. I just noticed that this year's vase is different from last year's. Those are both absolutely gorgeous! One look at the red tulips and I fell in love with them. They are so professionally arranged. Great pictures - I especially love the 1st one with the leaves. Beautiful glass vases. I like both of them a great deal. That is a GORGEOUS vase. Wow. Love the vases...the first is really special!